After another fine bit where he made an earnest and very personal appeal for former President Barack Obama to make a particular sacrifice to save us all, Colbert turned to yet one more topic of Trump’s tweets—and did a little campaigning. Noting that Trump’s blustering war against the media (summed up as “saying you’re crazy for seeing what’s obvious”) has now taken the form of some sort of “fake news” awards (honest to god, Trump may have commissioned little trophies and everything), Colbert has gone all-out to make sure all his nightly hard work isn’t overlooked. 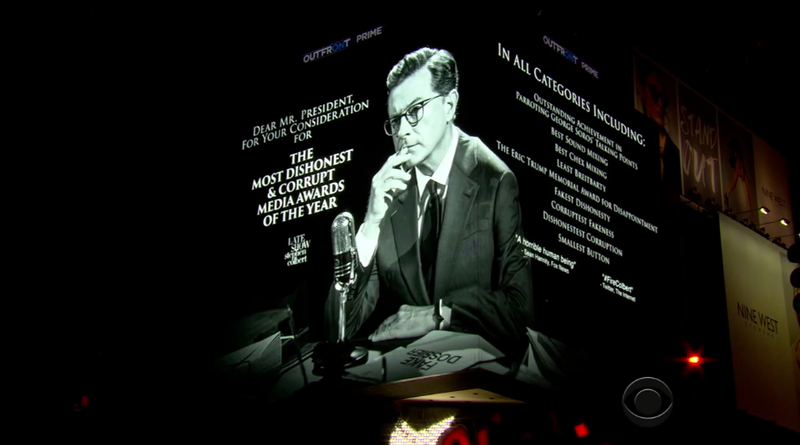 In his post-monologue desk piece, the host, assuring his audience that he’s dead serious at not being shut out of what he termed “The Fakies,” unveiled the massive (and very real) Times Square “for your consideration” billboard he’s had erected, complete with speculative categories like “Fakest Dishonesty,” and “The Eric Trump Memorial Award For Disappointment.” (It’s also on Colbert’s Twitter, so Trump will be sure to see it.) Perhaps to take the sting out of not being nominated for anything at Sunday’s Golden Globes this year, Colbert is perhaps looking to take the sting out by sweeping Trump’s apparently actually happening Fakies on Monday. Fingers crossed, although Colbert will have to get through us here at The A.V. Club first. Honestly, it’d be an honor just to be nominated.